Audio recordings of Ann Vaughan-Williams reading from her poetry collection The Lines We Trace. All welcome to the book launch at Love & Dye (Raynes Park, SW London) on 14 April 2018 at 7.30pm. This entry was posted by Robin Vaughan-Williams on Sunday, April 1st, 2018 at 19:30	and is filed under Poetry. You can follow any responses to this entry through the RSS 2.0 feed. You can leave a response, or trackback from your own site. A sequence of poems by Robin Vaughan-Williams, available from Happenstance Press. A must for those at the mercy of managers. Even more of a must for managers themselves. 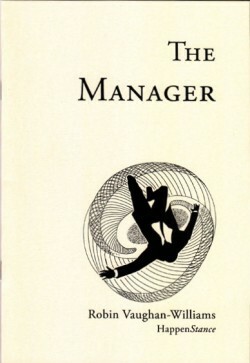 Buy The Manager at the Happenstance online shop or read more about it on zqme. And tonight's culinary invention is...macaroni tubes individually stuffed with slivers of grape (I had the patience to make 5 of them).